Microsoft Dynamics CRM Integration | 8x8, Inc.
Customers today demand a personalized experience every time they interact with your business. To ensure that a tailored experience is delivered, many business organizations often rely on robust Customer Relationship Management (CRM) systems that provide opportunities to manage and maximize customer relationships. CRMs essentially enable businesses to keep track of every interaction of every customer, and in turn, deliver actionable data that promotes enhanced customer engagement, increased sales productivity and healthier profitability. Microsoft Dynamics is one such popular CRM system that offers businesses a full spectrum of CRM through five individual apps — Sales, Customer Service, Field Service, Project Service Automation and Marketing. These individual apps work seamlessly together to help businesses to manage and monitor interactions with customers and create an efficient business ecosystem. Despite the multitude of benefits offered by Microsoft Dynamics CRM though, the wealth of customer data will not add any value if there isn’t seamless connectivity available between the CRM and other business-critical systems. For example, the centralized customer database lying within the Microsoft Dynamics CRM needs to be integrated well into the daily routines of call center agents, sales and marketing professionals or anyone managing the customer calls. Having the ability for the business representative to access customer data instantly will lead to more effective and personalized communication with the customer. It inevitably sends a signal to customers that your company knows them and you are willing to treat them with respect. Such a setup ensures professionalism in handling calls and enhances your customers' overall experience. This is where Microsoft Dynamics CRM integration plays a critical role. The integration process synchronizes the customer data between your Microsoft Dynamics CRM and other key business productivity apps. 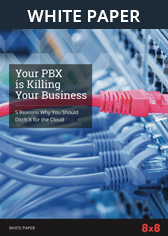 Cloud-hosted business communications solutions are now considered as a prime choice for companies of all sizes because of the numerous benefits over the aging on-premise phone systems. Apart from being cost-effective, cloud telephony systems are easy to deploy and comes with state-of-the-art features such as analytics, conference calling and call recordings to name a few. The access to the latest technology with low upfront investment is allowing businesses of all sizes to remain competitive and offer better customer service. Couple this cloud telephony software with a CRM, and you open an entirely new world of opportunities to take customer relations to the next level. Better Tracking - By integrating your phone system with the Microsoft Dynamics CRM, it is easy to get a detailed track record of each and every call made to the customers. Merging the call logs with the customer profiles from the CRM makes it easy to pinpoint specific call records that need investigation or require future follow-ups. Enhanced Efficiency - Having a seamless integration between your phone system and CRM means your employees would not require switching between the apps to make or receive calls. It is even possible to dial calls directly within the CRM interface where customer phone numbers are directly clickable. This essentially saves a significant amount of time and removes the possibility of human errors while dialing the numbers. Personalized Service - The data fetched from the CRM comes handy during inbound or outbound calls. As the customer calls, his/her profile will automatically pop up on the screen, letting your employee provide a more personalized and better service. The seamless integration also means access to all communication information from different channels such as social media, email, chat or issue ticketing system. This ensures a more positive conversation between your employee and the customer right from the start. Access to More Data - With a seamless alliance between your phone system and Microsoft Dynamics CRM, you get an access to invaluable data. Your phone system will give you details about call log history, the employee assigned to handle the call and call recordings. The CRM on the other side will provide additional customer information, customer leads and sales opportunities. Clubbing the two will help in filtering out critical data to plan effective upselling activities or better customer experience altogether. Microsoft Dynamics integration with your cloud-based system is indeed a great way to grab the untapped opportunities and bring more business for your company. However, it is crucial to select the right phone system that integrates well with your existing infrastructure; one that offers maximum opportunities for improvement with Microsoft Dynamics. The right choice can help you reach new customers and upsell current ones, but the wrong phone system can kill your ROIs entirely.